The quiet area within the Salzburg region is the ideal starting point for exciting trips, ski-tours and hikes. 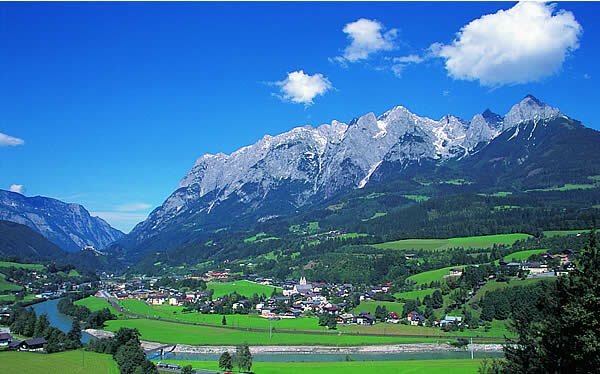 Pfarrwerfen is part of the holiday region of the Tennengebirge and is located directly on the Tauernradweg . The area offers a large variety of tourist opportunities to its vistors, in winter as well as in summer. It is a wonderful area for Hiking- and Skiing for the whole family! The solar heated outdoor swimming pool situated in a large garden with childrens playground is worth visiting. Take a walk, or ride your bike along the attractive paths of the Salzach river! In addition, Pfarrwerfen is the ideal starting point for many fantastic sights, for e.g Open air museum "7 Mühlen" , the Fortress Hohenwerfen or the famous Ice caves in Werfen .